The activities of the enormous water bird with the long yellow red-striped bill and the remarkable yellow pouch extended from the tip of the lower bill to the base of its throat, also the pink washed face and glossy pink plumage on pipe-like throat and crest are treats to curious eyes. 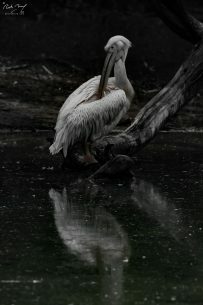 Pelicans mostly found swimming gently at freshwater bodies and rarely resting at adjacent lands. Their large pouch beneath the lower jaw helps them to catch and store large fishes at first and then swallow with ease.